Romac sends word that Auto Express in Britain are conducting a poll featuring a dashing young Saab. The Auto Express Design Award is a special prize given to the most head-turning car of recent months. Now, far be it from me to skew the poll in any way by letting you know who my favorite is, all I will hint at is that its name starts with “Saa…” and ends with “…iX”. m!ko, a Saab brother from Poland, has sent the team an e-mail requesting all of our help in Auto Swiat’s current “fan club of the year” poll. The club focuses on promoting safe driving, road rescue, and raising the qualifications of drivers on Polish roads. Page www.saabklub.pl brings together more than 15 000 members and a profile on a social networking site Facebook www.facebook.com / SaabKlubPolska has over 1 300 fans. Note: Participating in the poll requires confirming a link sent by e-mail. I guess it’s time to weigh opinion on the Saab PhoeniX concept. There has been plenty of coverage and no shortage of explanation about what PhoeniX is (a pure design concept), what is isn’t (a real production car), what parts of it might see production (IQon and the elements of front fascia) and what the heck those flying buttresses are there for. Plenty of comments have been made already. Now it’s time for your vote. Ther are three votes available. Essentially they represent those voting for the concept, those sitting on the fence for whatever reason, and those voting against. The 9-5 is currently in the third round, and up against the formidable Alfa Romeo Giulietta. Having won round 1, the 9-5 is now up against the Peugeot RCZ. Please click here if you feel like having your say. Theirs is a little different in that cars are pitted against one another in a bracket arrangement. The Saab 9-5 has to defeat the BMW X3 before it can move on to the second round, where it will take on either the Peugeot RCX or the Ford C-Max. Yes, the pairings are a little obtuse, but in the end, there can still be only one. If you feel like having a vote, click here and scroll down until the bracket arrangement appears (it may take a few moments). When I wrote yesterday about there being one engine option for the Saab 9-5 SportCombi in the US (and this was before we found out what that engine option would be), I included a poll on the subject. Eight variations were offered in the poll, covering different combinations with V6 and 2.0T, auto and manual transmissions, and XWD/FWD. More than 900 votes later, the results of the poll are pretty clear. Click. Bear in mind, this is not a scientific poll of intending Saab 9-5 SportCombi buyers. It’s a poll of Saab fans, a rather small percentage of whom might end up being Saab 9-5 SportCombi purchasers. But still, there’s some compelling stuff there. The 2.0T engine option seems to be the most preferred option by a considerable degree. 2.0T options outpaced their V6 counterparts in all combinations, and by a considerable margin. Manual gearboxes were preferred in three of the four classes of similar vehicles. The only combination that favoured an auto was V6 with XWD. The most surprising feature of the voting, for me, at least, was that XWD outpaced FWD in all classes of voting. The four FWD options were the four lowest vote-getters. That last one was a real surprise for me. Given that one of the arguments for the 2.0T could be better fuel economy in times of rising gas prices, I’d have thought the 2.0T FWD options might have fared better. The FWD model will retain all of Saab’s excellent winter weather driving characteristics, but without the weight and mileage penalties that accompany XWD. Possible conclusions – Fuel economy isn’t quite as significant as people say (alt, we have a vocal minority) – or – people just want the latest stuff. Interesting times. Thanks for casting your vote. I’ve had quite a few people emailing me about the floods, some asking if we’re OK.
We are absolutely OK. Australia’s a big place and whilst there has been a lot of rain here in Tasmania and some flooding in the north of the state, there’s nothing at all that effects us here in the south. Thanks to all for your concern. Of course, the big floods are in Queensland, the northernmost state on the east coast of Australia. We’ve all been glued to our TV’s here and there has been plenty to see, around 95% of it quite tragic. Image from Grantham, the town probably worst hit by the floods, which claimed houses, vehicles and lives in just minutes. Everyone in southern Australia knows someone who’s moved to Queensland in the last 10 years or so, quite a few of them to Brisbane. We all feel like we’ve got someone involved in this in some way. If you’ve never seen how a flash flood progresses, watch this video from Toowoomba, which was hit without warning by a flash flood earlier this week (much of this is the water that’s effecting Brisbane now). Amazing. Personally speaking, one of my good friends will have to find somewhere else to live. Her house (a rental, so it’s not hers to rebuild) was overcome very early in the Brisbane flood. Thankfully, she got most of her stuff out and of course, the best news is that she’s safe. I have a few semi-regular Saab contacts up there, as well, one of whom (Simon L) owns a Saab 99 Turbo that I used to own. Simon lives on high ground and was never in any trouble from the water. Some of you might be familiar with a bloke named AussieLars, who comments here occasionally. Lars got his Viggen on to high ground before the water came, but there was some concern about the Saab 96 V4 that’s he had stripped and part-way through restoration. Obviously, it wasn’t as portable as the Viggen and time was very short. As it happens, the water level wasn’t quite as high as people feared and for Lars, that means that the 96 will just need some mild cleanup. Nothing too major. He and Mrs AussieLars will be just fine, which is great to hear. There are plenty of harrowing stories, however, the most striking and heartbreaking of which is probably that of Jordan Rice and his mother, Donna. Click here. If you feel moved to support flood victims, many of whom will not be covered by insurance because of their proximity to the river (and because insurers can be bastards sometimes), then I invite you to donate to the Premier’s Flood Relief Appeal, the primary fundraising effort run by the Queensland government. Again, thanks for your concern, not just personally, but for all the people in Queensland who have done it so tough in the last few weeks. Beijing Automotive, who were looking to buy Saab back in 2009 but settled for $200m worth of older-generation tooling, are trialling 30 electric cars with the local government in Beijing. A number of them are based on the Saab 9-3. 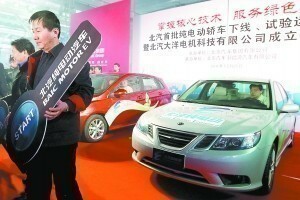 Beijing Auto has started production of electric ‘Saab’ 9-3’s. The car is called Q60FB and is part of a trial project for electric cars with the Beijing city government. They will make 30 cars in total, including a number of electric BC301Z’s, called the C30DB and a number of electric minivans called MR30DB. The full story is over at thetycho.com. BAIC were always pretty serious about doing electric vehicles and using the Saab tooling they bought as part of the project. It’s good to see them progressing on this and I don’t think it’s a bad thing that they’ve used Saab’s bodies instead of their own for such a project. I wrote about a new Saab dealership popping up in Seattle a few months ago, but they weren’t online at the time. It’s good to see Saab of Bellevue are now up and running. The Saab 9-5 won a Car of the Year vote in Finland, and I’m pretty sure SU had absolutely nothing to do with it. I asked the question as to what people were planning in 2011 last night, but with nearly 150 comments on the article, it’s difficult to get a quick feel for what’s happening. I figured a poll might be a good way to get a snapshot of what SU readers will be doing this year to satisfy their automotive itch. In recognition of the fact that some of you might be doing a few things, you can select up to three separate answers in this poll. As such, this will be a measure of ‘events’ rather than just what’s the most popular option?